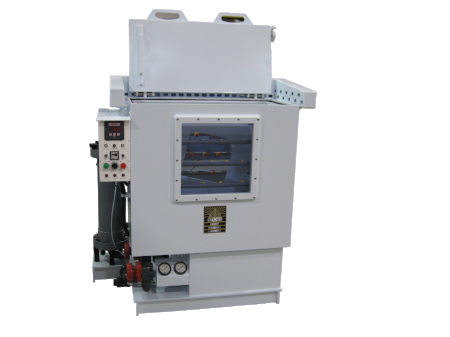 Circuit Chemistry Equipment offers custom built equipment for various wet processing industries. Our design team works with you from the initial concept to the final product, and designs to your exact process and product specifications. Not only are we an original equipment manufacturer, but we are also a distributor for many individual components. If your company has a preference regarding a specific manufacturer, model of pump, heater, instrumentation, etc., CCE will use those items in our design. Our goal is to provide you with a simple, durable, and cost effective product that will provide years of service. This compact, self-contained, vertical spraying station features easy top loading of a 25” diameter process fixture. Spray is applied to each side of the fixture by front and rear manifolds. The pressure for each spray manifold is individually controlled with a diaphragm valve. Complete coverage is accomplished with the use of cone-spray nozzles along with rotary and vertical motion. 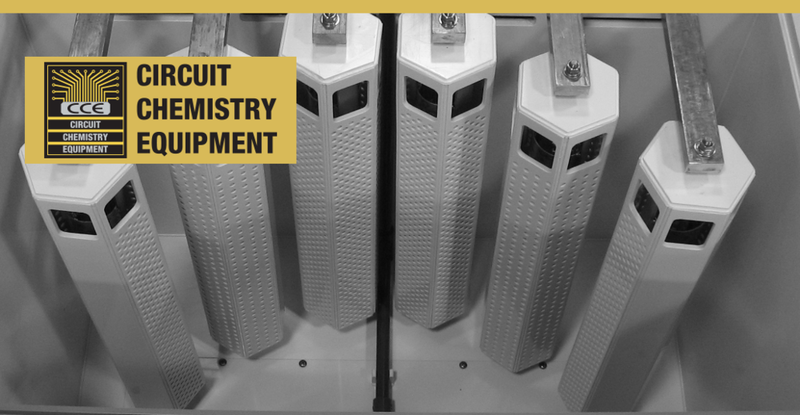 Circuit Chemistry Equipment can design and build specialty tanks for your wet processing needs. Fabricated tanks and plumbing are available in a range of materials that are compatible with your process chemistry including polypropylene, polyethylene, PVC/CPVC or PVDF. Stainless steel or encapsulated steel support girths provide additional stability as needed. Extend the life of potassium permanganate etch back and desmear processes with a compact EPR module. By eliminating solids and sludge buildup, your process line can run longer and more efficiently, reducing costly chemical consumption. We are proud that our quality management system is certified according to ISO 9001:2015, showing our commitment to provide quality products and services and to continuous improvement.